The Dalai Lama Home, today is in Dharamsala India also known as Little Lhasa, Dharamshala. His Holiness, Tenzin Gyatso, the 14th Dalai Lama was born on July 06th, 1935 in a small village of Taktser in the North Eastern province of Amdo in Tibet, his country of birth. He was one of the children of a poor farmer’s family who mostly grew barley, buckwheat and potatoes. He was named “Lhamo Thondup”which means literally ‘Wish-Fulfilling Goddess’. At present his hometown in India is in his home city of Dharamsala in Northen India, in the hill state of Himachal Pradesh. It is now the hub for all Dalai Lama News, Dalai Lama in Exile, the Tibetan Government in Exile as the place of Dalai Lama residence..from where the Free Tibet movement was initaited around the globe. The Dalai Lama residence is often seen in many Dalai Lama pictures of Dharamshala in India. It is situated near the Dalai Lama monastery in Mcleodganj Dharamsala. Thousands of visitors from all over the world come to visit His Holiness hometown, to catch a glimpse of this Buddhist Spiritual Teacher in his surrogate country and home city, Dharamsala in India. The Dalai Lama news often highlights His Holiness Teachings in the Dalai Lama Temple every year. The Tibetan Government in Exile, is often flooded with queries like . " Where does the Dalai Lama live in Dharamsala ? " ! Dalai Lama Home in Dharamshala ! The town of Dharamsala lies in the northern Himalayan state of Himachal Pradesh in India. The mountain state attracts pilgrims, tourists and celebraties from around the globe. Many are curious about the Dalai Lama home, many enjoy the Dalai temple, famous shrines and monasteries, forts n history while the adventure lovers prefer overnight camping on exciting Dharamsala treks. 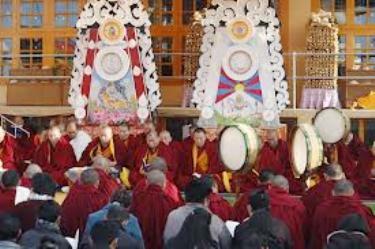 With the advent of the Tibetan Government in Exile coming in existence here, the Dharamsala Tourism has flourished with different flavors of culture, cuisine and music in Dharamsala India. Many from around the globe visit Dharamshala to attend His Holiness the Dalai Lama sacred teachings and enjoy the scenic beauty of the valley. 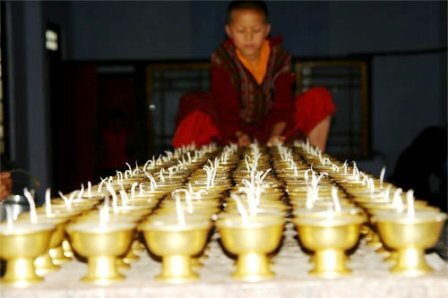 While on your visit here you can visit His Holiness the 17th Karmapa's monastery along with the Dalai Lama's Oracle monastery. For your Dharamsala Hotel, enjoy Himalayan Hospitality & Home Stay at Vidya Niwas, Dharamsala.